Obituary for Mary Elizabeth (Carpenter) Hutchison | Herald & Stewart Home-Funerals, Inc.
Mary Elizabeth Carpenter Hutchison, widow of Raymond Clarence Hutchison Sr., passed away Thursday, February 7, 2019. She was a 97 year old native of Bath County, daughter of the late John William and Clarissa Davis Carpenter, retired dietician from Mary Chiles Hospital, and member of Somerset Christian Church. 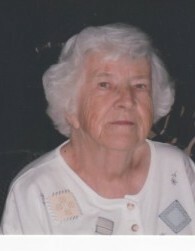 She is survived by a son, Raymond (Clara) Hutchison Jr. of Winchester, 2 daughters, Dorcas Hutchison Blevins of Paris and Edwina Hutchison Taylor of Tuscan, Arizona, 7 grandchildren, 3 step-grandchildren, several great-grandchildren and great-great-grandchildren, a sister, Geneva Carpenter Durham of Tennessee, a brother, Arthur Carpenter of Kentucky, and several nieces and nephews. She was preceded in death by a sister, Thelma Pearl Setters, a brother, William Brooks Carpenter, a son-in-law, Robert Earl "Sharkey" Blevins, a daughter-in-law, Vicki Boone Hutchison, a stepgranddaughter, Cheryl Ann Taylor, special friend, Janice Boone, and a special great uncle and aunt who raised her, Richard and Nancy Conley Goodpaster. Her funeral will be 2:00 Monday at Herald & Stewart Home for Funerals, Pastor Thomas Hall presiding, with burial in Machpelah Cemetery. Friends may call from 3-5:00 Sunday.